This treatment uses light technology to create change in the Skin. Intense Pulse Light, and in the cause of acne, we use a blue light on our IPL settings. 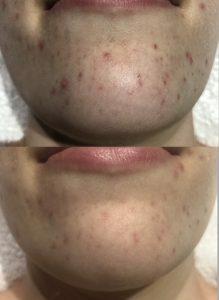 This treatment that addresses both the p.acne bacteria, as well as the pigmentation and redness of your skin. WIN. The treatment is pain-free with no downtime. We tailor a mask or peel to accompany this treatment for absolute superior results. Pigmentation treatments performed with IPL are accomplished through heating and breaking down the melanin whilst retaining the integrity of the surrounding tissue. We perform IPL on the effected areas, full face, neck, chest and even the back of the hands. Once we have safely used the Intense Pulse Light to heat the melanin you can sometimes feel a little heat over the next 24 hours. There is no down time with this treatment. The pigmented areas that have been treated will start to go darker in colour, raise and sometimes feel gritty. This is all apart of the elimination process. This can then be gently exfoliated off. 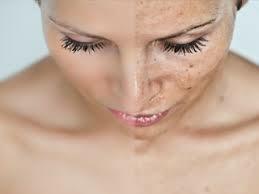 The number of treatments needed will depend on the type and severity of pigmentation. For more information ask your SKN therapist for a thorough consultation.